Nationwide, there are over 5.5 million 4-H youth in 4-H organizations. 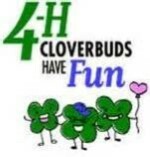 Cloverbuds are youth who participate in a 4-H program designed for grades K-2. Cloverbuds have the opportunity to try a variety of projects & activities; building, cooking, photography and learning about animals are just a few of the choices. Each year, the 4-H staff in the Columbia County Extension Office create a Cloverbud activity guide that gives some suggestions. A county-wide committee usually schedules several activities for all Cloverbuds in the county to attend. Parents are encouraged to become involved in the committee and/or to help at county events. Cloverbuds are encouraged to participate in the Communication Arts Festival and county Demonstration Contest. Project Spotlight offers several classes aimed at the Cloverbud group. Foods Revue gives Cloverbuds an opportunity to shine. A summer day camp just for Cloverbuds is held each year. Several family events and learning activities are held throughout the year and Cloverbuds are encouraged to attend. For more information, please contact the UW- Extension Office at 608-742-9680.